Well, it was bound to happen! The most popular and bloodiest anime story ever made has been REMADE... and the heroes are kids and teachers in junior high! 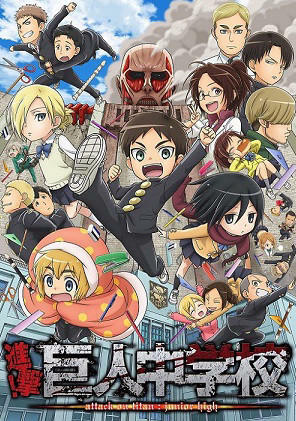 Yes indeed, Eren Yeager and company have to contend with the everyday pitfalls of trying to make it in school. And what of those giantantic, cannibalistic Titans you might ask? They are now the bullies who dwell beyond the walls, who often steal the kids lunches! So strap-on your 3-D maneuvering gear and get ready for school like you've never seen it!